The Today show kicked off the new year by announcing that Hoda Kotb will permanently replace alleged sexual predator Matt Lauer as co-anchor. Kotb, a 25-year broadcasting veteran who’s been with NBC since 1998 (when she joined Dateline as a correspondent), has been filling in for Lauer since the allegations against Lauer first broke. Today co-anchor Savannah Guthrie made the big announcement this morning with Kotb by her side. “You are a partner and a friend and a sister and I am so happy to be doing this,” Guthrie told Kotb on air. Kotb was also seated next to Guthrie when the latter first broke the news of the allegations against Lauer, who’s been accused of sexual harassment and assault by several of his former colleagues and subordinates. 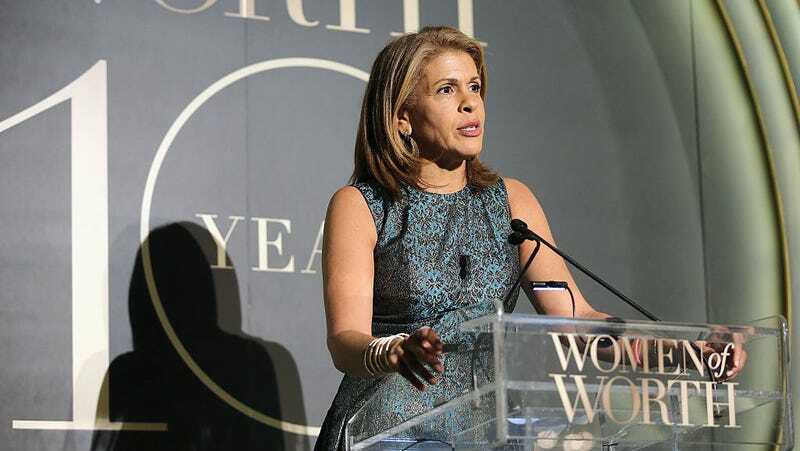 NBC chairman Andy Lack emailed a statement to employees about Kotb’s promotion, noting how she’d “seamlessly stepped into the co-anchor role alongside Savannah, and the two have quickly hit the ground running. They have an undeniable connection with each other and most importantly, with viewers, a hallmark of Today.” The ratings have held up since Lauer’s firing, with the morning show nabbing a rare win in its time slot in December. And don’t worry about Kathie Lee Gifford—Kotb will continue to co-host the 10 a.m. hour of Today alongside her partner in shenanigans.